Americans aged 65 and older are the fastest growing segment of the population. 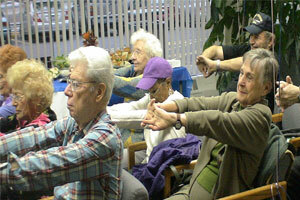 The field of geriatrics was created to address the special needs of older adults. The Division of Geriatrics at Montefiore Medical Center offers a variety of treatments and services to help older adults meet those challenges. Our staff of expert Geriatricians (physicians specializing in geriatrics) provide excellent primary care services tailored specifically to older people. Services include diagnosing and treating common medical conditions such as high blood pressure, high cholesterol, heart conditions, arthritis, emphysema and diabetes. Deciding how and where to care for an elderly person can be a complicated and emotionally difficult experience. We offer complete patient evaluations to assess the needs of each person and recommend a plan to them and their caregivers. We help in managing medication, coordinating home care and rehabilitation services, and evaluating older people for nursing home placement. We specialize in the medical and psychosocial evaluation and the ongoing care of older adults with dementia. Our physicians consider the patient's life and family when devising a care plan for those with memory loss, depression, or Alzheimer's disease and other dementias. For an older person, a simple fall can be catastrophic, and more than one-third of community-dwelling adults age 65 or older fall every year. Our Falls Assessment Program makes recommendations to reduce a patient's risk for falls by reviewing the person's medical and medication history and conducting a complete physical examination, including tests of vision and hearing, and assessing walking and balance. One-third of women and one-fifth of men over age 50 will experience fractures due to the bone-thinning condition known as osteoporosis. The bone loss from osteoporosis can be minimized through early diagnosis and a specialized program that includes medication, diet and exercise. The Geriatrics Ambulatory Practice Bone Center provides screening for primary and secondary causes of osteoporosis, nutrition and exercise advice, fracture prevention and treatment with medications. Home-bound older adults who are physically frail, have trouble walking or have memory problems may benefit from some type of at-home care. Our Geriatric Home Visiting Program provides comprehensive healthcare services to home-bound seniors including physical exams, treatment of acute and chronic medical problems, medication management, vaccinations and flu shots, lab tests and more. Older adults who are admitted to Montefiore receive care that addresses all aspects of their health. This care includes providing intensive medical management, maintaining physical and cognitive function in the hospital, addressing decision making and advance directives, and developing a discharge plan in collaboration with their family and caregivers.